Cube boneless and skinless chicken breast and place in a bowl. Mix in scallions, diced celery, light mayonnaise, chopped chives, Dijon mustard, pepper, salt and cayenne. Blend the mixture thoroughly. 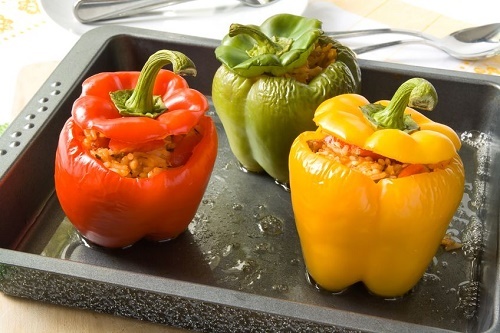 Cut a bell pepper in half, clean out the insides and stuff with the mixture. Garnish with chives. Low-calorie snacks don’t have to be boring. The sheer variety that you have will help keep you interested. What’s your favorite low-calorie summer snack?